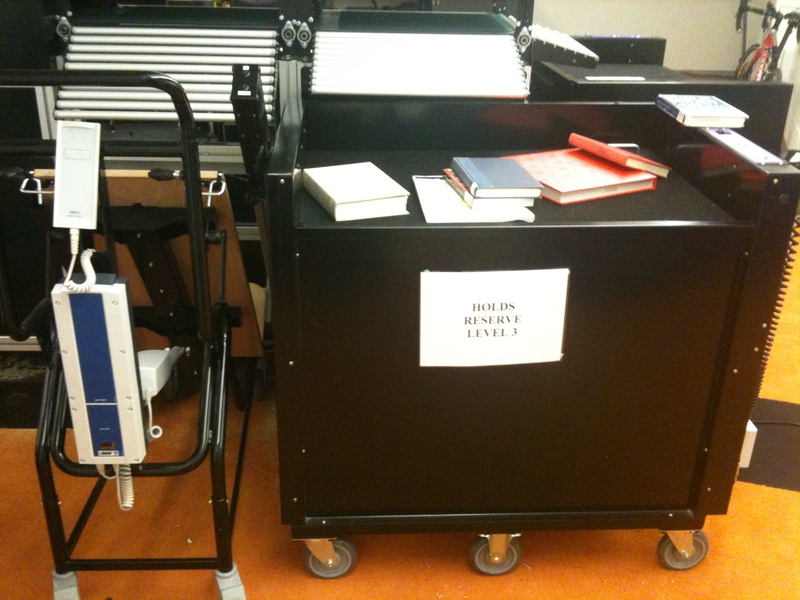 On Wednesday QLS arrived to install our new automatic trolleys on the ERC Library 5 bin ARS (Automated Returns Sorter). It’s been working for awhile now happily with bins, however some funds were made available to trial a trolley that loads itself. Will be good to do some actual real evaluation on time savings, manual handling benefits, staff feel etc as opposed to emptying bins onto manually loaded trolleys. We bought 2 trolleys and a stacker (bit you plug them into on the ARS) and will be using it only on 1 return slot, alternating trolleys whilst one is being taken downstairs to be unloaded. Remaining 4 slots will have bins. Pro’s: Don’t have to load from bin to trolley; it works! no books on floor yet. I’ll make sure the estimable Robert (poor guy I draft in as my implementer for my flings with technology) is available to answer technical questions, whilst I dance around going “Look, look, it’s new, so cool, press this button”. See my Youtube for a video of how the trolley raises with books on it.